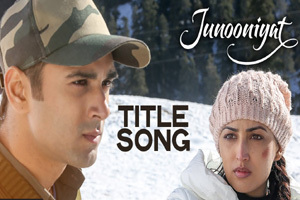 Nice title song sung by Falak Shabir featuring Pulkit Samrat, Yami Gautam. Star Cast: Pulkit Samrat, Yami Gautam. The video of this song is available on YouTube at the official channel T-Series. This video is of 2 minutes 36 seconds duration. Lyrics of "Junooniyat (Title Song)"
Lyrics in Hindi (Unicode) of "जुनूनियत (टाइटल सोंग)"